Scott Douglas Gerber. A distinct judicial power : the origins of an independent judiciary, 1606-1787. Oxford University Press, c2011. This book provides the first comprehensive critical analysis of the origins of judicial independence in the United States. 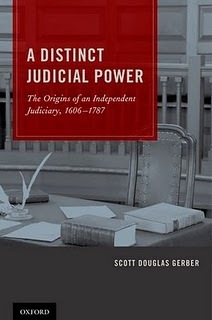 It examines the political theory of an independent judiciary, chronicles how each of the original thirteen states and their colonial antecedents treated their respective judiciaries, and explores the influence the colonial and early state experiences had on the federal model that followed and on the nature of the regime itself. Kayoko Takeda. Interpreting the Tokyo War Crimes Trial : a sociopolitical analysis. University of Ottawa Press, c2010. In order to ensure its absolute authority, the Tokyo War Crimes Tribunal (1946–1948) adopted a three-tier structure for its interpreting: Japanese nationals interpreted the proceedings, second-generation Japanese-Americans monitored the interpreting, and Caucasian U.S. military officers arbitrated the disputes. This original case study of the trial illuminates how complex issues such as trust, power, control and race affect interpreting at international tribunals in times of conflict. Financial regulation at the crossroads : implications for supervision, institutional design and trade / edited by Panagiotis Delimatsis, Nils Herger. Aspen Publishers, c2011. Franklin A. Gevurtz. Corporation law. 2nd ed. West, c2010. Sarah H. Ramsey, Douglas E. Abrams. Children and the law in a nutshell. West, c2011. Peter Hay, Patrick J. Borchers, Symeon C. Symeonides. Conflict of laws. 5th ed. West, c2010. Brett Busby. Handling your first civil appeal, 2011. State Bar of Texas, c2011. Judy Kostura. Damages in civil litigation course. State Bar of Texas, c2011. Thomas N. Tarnay. Intellectual property law course 101 : IP agreements. State Bar of Texas, c2011. Robert A. Hillman. Principles of contract law. 2nd ed. West, c2009. Crime, criminal law, and the recession. University of Chicago Law School. c2010. The handbook of comparative criminal law / edited by Kevin Jon Heller, Markus D. Dubber. Stanford Law Books, 2011. Carl A. Blair. Climate change and national security : securing our future in an age of increasing uncertainty. University of Houston Law Center, 2010. Karen Davies. Understanding European Union law. 4th ed. Routledge, 2011. Michael R. Arkfeld. Arkfeld's best practices guide for ESI pretrial discovery : strategy and tactics. LexisNexis, c2011. James E. Pfander. Principles of federal jurisdiction. 2nd ed. West, c2011. Concise international and European IP law : TRIPS, Paris Convention, European enforcement and transfer of technology / edited by Thomas Cottier, Pierre Véron. 2nd ed. Aspen Publishers, c2011. Gary Myers. Principles of intellectual property law. Thomson/West, c2008. Ralph H. Folsom, Michael Wallace Gordon, John A. Spanogle, Jr. Principles of international business transactions. 2nd ed. Thomson/West, c2010. Marcella Marlowe. Jurisprudential regimes : the Supreme Court, civil rights, and the life cycle of judicial doctrine. LFB Scholarly Pub., 2011. Jessica C. Van Buren, Mari J. F. Cheney, Marsha C. Thomas. Utah legal research. William S. Hein, 2011. Michael R. Arkfeld. Arkfeld's best practices guide Information technology primer for legal professionals. LexisNexis, 2011. Michael I. Krauss. Principles of products liability. West, c2011. Jimmy Gurulé, Geoffrey S. Corn. Principles of counter-terrorism law. West, c2011. Marshall S. Shapo. Principles of tort law. 3rd ed. Thomson/West, c2010. William M. McGovern, Jr., Sheldon F. Kurtz, David M. English. Wills, trusts, and estates : including taxation and future interests. 4th ed. West, c2010. Andrew Walker. The Nazi war trials. Pocket Essentials, 2006.